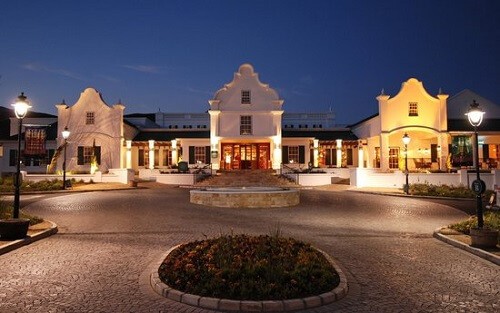 In the Boland of the Western Cape, Golden Valley Casino is a gem in Worcester, the largest town in Breede River Valley. Its building is inspired by Cape Dutch architecture. It’s scenic and historical, with winelands and museums. Whether you’re on a business trip, stop over, or weekend getaway, enjoy a taste of the Boland at this Sun International casino. The Golden Valley Casino promises an intimate gambling experience. Visitors can go to the casino 24/7 for a great time at any time. Although small, it’s big on entertainment. With 220 slot games and six table games to choose from, there are various options for striking it lucky. Play blackjack, American roulette, or Raise ‘em poker in at the non-smoking floor. Guests will find the stunning Golden Valley Lodge nestled between the rolling mountains and natural fynbos of the Western Cape. The lodge promises the best three-star accommodation in Worcester. Stay in large family-sized rooms with all the modern amenities ensuring a comfortable stay. Other Facilities at Golden Valley. The Winners Sports Bar is the best place to go to for live entertainment, some pub grub, and sports broadcasts. They also host karaoke nights every Thursday evenings. For more family-friendly dining, there the Kuipers Restaurant. It’s known for its home-style South African cuisine in a sophisticated environment. While gaming in the casino, guests with young children can make use of Harry’s Corner. They accept children between two and 17 years old. They’ll be supervised by trained professionals while you enjoy yourself on the casino floor. Golden Valley also provides some amazing facilities for hosting meetings, conferences, small banquets, and even weddings. The Body DeVine Spa is Golden Valley’s go-to for some relaxing spa treatments and beauty therapy. Besides making use of the facilities at Golden Valley, guests can opt to venture out of the casino. There’s plenty to do, such as going on a safari drive at Fairy Glen Private Game Reserve, the Karoo Desert National Botanical Gardens, and golf at the Worcester Golf Club among many other things. For more on casinos in the Western Cape, read our guide here on CasinoZA.